Now, being pedantic w/r/t* geography, Marrakech is in CENTRAL Morocco. But it’s further south of everywhere bar the desert I visited, and I’m afraid I like that non-sequitur pun too much to delete it. In total I spent five nights in Marrakech in three short bursts, using it as a base to visit Essaouira and the Sahara, both of which I have blogged about already. As a busy Moroccan city, it felt a bit more tourist-orientated than Fes, the souks and the stalls and the cafes and the restaurants much more frequently aimed at, solely, the foreign dollar rather than traditionally-minded locals. There were bars where one could buy alcoholic drinks and (I’m pretty certain) prostitutes, there were a lot of police so one was bothered** less by drug dealers, but a lot of the shops and stalls were selling tat, absolute tat, cheap, mass-produced tat. I bought some souvenirs, yes, for other people, and probably paid over the odds. Little bit of hustling. I bought my sister some Beats by Dr Dre headphones for only five euros – I’m a bit worried they might be stolen, or possibly even forgeries, but I am a very trusting individual and so will take them at face value. As will she, not someone known for her questioning mind. The food in Marrakech was bad, mediocre, the medina was busy but relaxed, the fresh orange juice cheap and delicious, the main museum expensive and terribly organised but containing some genuinely beautiful objects including a stunning, huge chandelier, and the neighbouring medersa (Quran school) an elegant, intricately decorated building reminiscent of the Alhambra. 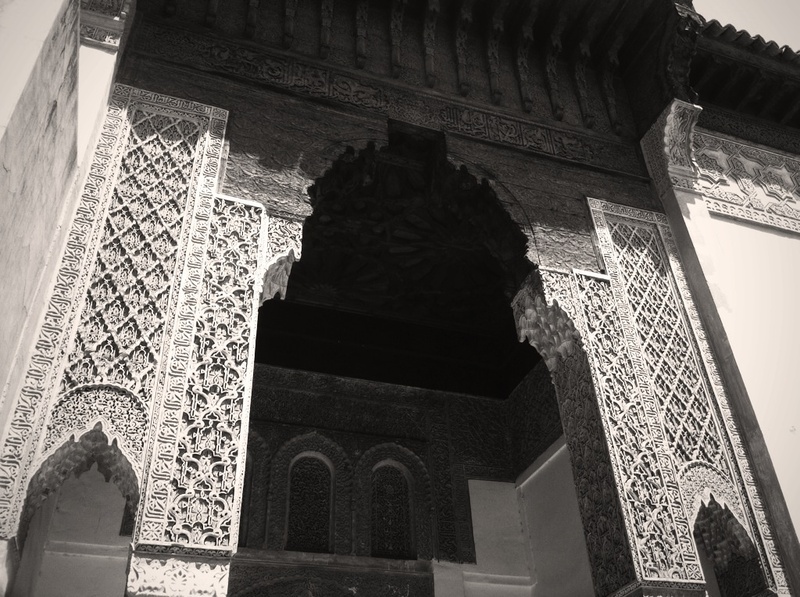 Also worth visiting are the Saadian Tombs, a rather pleasant mausoleum complex accessed through a narrow passage, hidden for hundreds of years until “discovered” by aerial photography in the 20th century. On the whole, the city is interesting, but its main sights, such as the Jemaa Al Fna, the big snake-charmer, monkey-seller, child-boxer***, street-food, whatever-hosting square, are very exploit-geared. There are lots of hostels, several beautiful buildings, booze if you want it… But there are also plenty of boring things like the ruined Palais El Badii. It’s a good base, and there’s a lot to see and do, but it’s much less authentic than Fes, much warmer than Essaouira, less beautiful than the desert and Chefchaouen, but definitely a much, much nicer place to be than Tangier. My time in Morocco is very nearly over. I have written this on the train to Casablanca, allegedly a rather unpleasant city most travellers avoid. I am sat in a carriage with a large group of strangers who have made friends. One is a provocatively dressed 40-something woman who keeps smiling at me and has, on more than one occasion, tapped my leg with her naked foot. Not the kind of thing one expects here. She also keeps making phone calls that involve her singing for three, four minute stretches, and she is eating food from McDonalds. And has just offered me a sip of her Fanta. Strange. On my penultimate day here I have finally encountered a modern Moroccan woman. They do exist. I may be finding her a little irritating, I’m OF COURSE trying to read, but with my feminist credentials still intact, as an idea and an actuality I’m rather pleased to have been sat opposite her. Not everyone here has been destroyed by tradition. Right on, sister! *See previous blogs for details about how much I miss Infinite Jest. Also note the increasing use of footnotes as a way of keeping the memories alive. **I found them a bother, other travellers may find them a boon. ***According to Lonely Planet and a Scottish man I met who claimed to have seen them. I didn’t, and I looked and looked and looked. As another example of my weird quasi-breakdown in normative thought patterns, the opportunity to watch and gamble on two eight-year-olds attempting to knock each other unconscious was something I REALLY, REALLY wanted to see. Missing this is a bigger travel regret than missing Volubilis. But less of a regret than losing Infinite Jest.